As the third largest city in Morocco with nearly 1 million people, Marrakesh is a fantastic travel introduction to the African continent. Sauntering through its many souks and bazaars, taking in the cacophony of drums and dances, and enjoying your first Berber tea is only one part of what this city offers. There is also a wealth of historic mosques andmonuments dotted around the Medina, or Old City, which contrasts with its more urbane Ville Nouvelle and its connecting parks. This provides the ideal opportunity to take in the African experience in all its traditional glory. As ever, being prepared is of utmost importance. Sweltering summer temperatures can reach above 100 degrees in Marrakesh, and the accompanying humidity can make temperatures feel even hotter. Always drink bottled water to rehydrate. Also, be aware you’re visiting a new continent and therefore are more susceptible to particular diseases; always ensure you have the appropriate vaccinations and medical coverage. Remember to keep a diligent eye on your belongings, and don’t pay a price for goods that you think is too high. Always haggle--don’t be fooled by pleasant smiles and tones from salesmen. The charming Old City has much to offer. The main square, Djemaa El-Fna, is a chaotic bustling arena packed with musicians, snake charmers, story tellers, shops, restaurants and more. Its vibrancy is contagious as you wander around almost aimlessly trying to take in the enthralling atmosphere. Connected to the main square, you’ll find the narrow cobbled alleyways of the souks where you can pretty much find everything at very reasonable prices. As before, always haggle, as once the shopkeepers realize you’re a tourist, the cost hikes up. Occasionally, you’ll have to move to the side as a cargo donkey passes by, but this adds to the unique charm of this commercial environment. 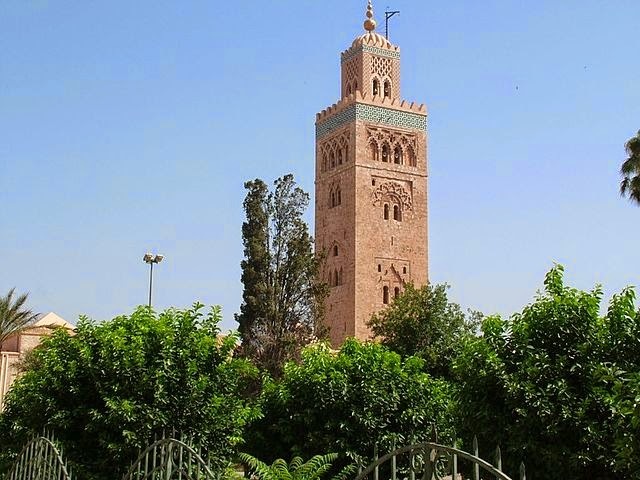 Take the time to visit some of the spectacular sights: The Koutoubia Mosque is right in the immediate vicinity of the Medina and hosts a wonderful towering minaret that illuminates at night. It’ll probably strike you at this stage how sanguine everything appears, including Koutoubia, which explains why the city is nicknamed the “Red City”. As you stroll down these crimson paths, don’t miss the ornate El Bahia Palace with its tranquil gardens. This palace was originally used by noblemen in the 19th century and for only 10 Dirhams (1.20 USD), it’s well worth a visit. Marrakesh has a stunning variety of gardens and parks that are well worth exploring. Luscious gardens such as the Palmeraie, Majorelle and Menara are oases that add a touch of nature to your travels. Article and photo contributed by Susie Jones. Marrakech (or Marrakesh) is really magical and a great place to travel.